Updated at 8:18 a.m. Eastern. Dubai's main stock exchange dropped more than 7 percent and Abu Dhabi markets slid more than 8 percent on the first day of trading since officials went public with the city-state's huge debt crisis. Shares of DP World, a profitable port operating division of the debt-ridden Dubai World, were off nearly 15 percent in early trading Monday when the market opened. The drop mirrored the turmoil on world markets after Dubai officials last Wednesday announced that Dubai World, the emirate's investment and development engine, would seek a six-month delay in paying creditors on nearly $60 billion in debt. A top Dubai finance official said the heavily indebted Dubai World is not guaranteed by the emirate's government. Abdulrahman al-Saleh, director general of Dubai's Finance Department, says lenders to the conglomerate bear some responsibility for the current crisis. He says they lent money based on the viability of the firm's projects, not because of government guarantees. Al-Saleh said while Dubai owns Dubai World, it has been known since the conglomerate was established that it was independent and that it "is not guaranteed by the government." In an effort to calm the regional markets that have closed since last week due to an Islamic holiday, the United Arab Emirates central bank on Sunday pledged to stand behind foreign and domestic banks in the country and offered additional money. Asian stock markets rebounded Monday from their steep fall last week after the United Arab Emirates moved to contain the fallout from Dubai's debt crisis. Major markets jumped by 2 percent or more after tumbling on Friday amid fears Dubai's debt problems could lead to more financial instability and were a sign of hidden troubles elsewhere in the still weak world economy. 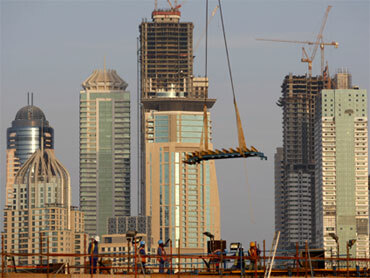 Once-booming Dubai has become the main victim of the global recession in the Gulf.